Great run.. Awesome fun.. I wud hav kicked myself if I had wuss'd out of run for that silly sinus block. Left for Mysore from Cubbon @ 4.30. The drive itself was so much fun.. Non-stop entertainment from Sensei 'n Balaji. PJs galore.. Had the historic(?) Maddur vada and great coffee on the way. Checked-in to a hotel.. had dinner and rested for the race. Woke up feeling great on Sunday!! Got ready and headed to the race-location. Coach wasn't particularly happy that I had forgotten to collect the bib and had to take a detour on the race day... Over 700 runners crowded the start-point. The Full-ers started first.. Sensei and Santhosh shot off.. 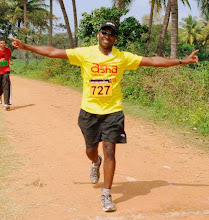 I think, Half-Marathon is a sweet-distance.. 21K is a great test of fitness 'n endurance.. Doesn't take a lot out of you and less prone to injuries.. I wonder why these crazies run the full to get roasted..
Then we started.. With my (un)training, I knew I cudn't shoot for a personal best. The focus was to finish strong with out any injury. The Trail was a beauty! Gorgeous Kaveri flowing on one side and brilliant-green fields on the other. After the initial 2K or so, I was nice and loose.. felt good.. kept myself well hydrated.. Reached the turn around point with no fuss... The first half was eazy..
And then trail-beauty turned a smoking hottie.. The scorching sun was too much..When I was struggling and thought, I'm gonna walk the rest - I heard someone yell, "Common Vinodh - run!!". There she was.. The super-woman.. I ran with Sensei for a few kms.. She was saying, "I ran all the way.. Didn take a walk-break yet". The last stretch was tough.. started cramping and Hamstring hurt.. It all meant only one-thing. I shd stop giving work excuses 'n turn-up at the Training sessions and hit the gym regularly..
And flew to the finish line. Not great timing. But awesome fun.. Here we go.. Leaving to Mysore for the Kaveri Half-marathon.. The build-up to the marathon has been a touch short of ideal.. Lets see, If I can pull it off.. There is a much bigger cause..
More on Monday.. Wish me luck..